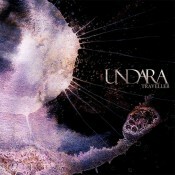 And I quote: “Undara is a relatively open project which congregates musicians…from different musical corners…on a common vision or principle: to work on the symbiosis of organic and synthetic elements to create pieces of hypnotic and introspective nature.” Well, that’s a mouthful. Let me sum it up: Traveller, the debut release from Undara, makes full use of the conclave’s cited influences, from Steve Roach to Jorge Reyes to Tuu, to deliver a journey with its feet rooted in tribal textures but ranging into broad sonic spaces.Percussion, including udu and darbuka, plays a central role in delivering that gather-the-tribe feel, assisted by ocarina, didgeridoo, bowls, and, believe it or not, goat hooves. The earthy elements are underlain with soft synth washes and atmospheric sounds, and all this together makes Traveller a very solid tribal-ambient disc. Traveller kicks off in a shadow-thick and serpentine space, with growling drones offset by the sharp ceramic rap and hollow gulp of the udu taking the percussive lead, particularly on “Seed of Storms.” I catch aural glimpses of Roach’s Spirit Dome in the backdrop washes here, but my attention is firmly taken by the udu. There’s a nice ritualistic feel at play, and the rhythm grabs hold of you. “Hearts of Darkness” folds didgeridoo into cool, dark washes. Distorted vocal samples make a call to prayer, and the whole thing lands right in my tribal-digging sweet spot. There’s a lot of depth of sound, a space to fall into, guided by the persistence of the beat. The disc touches its darkest point on the droning, sometimes clamoring movements in “Dawning Ecstasis.” At this stage the disc has taken a logical, organic route downward, showing an appreciable sense of narrative and structure–and this pays off even more when, beginning with “Cosmic Drift,” it heads slightly the other way. The energetic beats return, the pads lighten slightly, and the transition is handled with appropriate slowness and without entirely giving up the darkness at the edges. When you get to “Islands of Fog,” it takes a surprising turn. This is a beautiful, slow-handed guitar piece, with A. Guerrra piecing out a quiet melody over windswept pads. It’s got a dreamlike quality that begs for a close listen. The interplay between guitar and electronics is subtle and spot-on. “Perpetual Motion” walks a fine line between light and dark, pairing didge yelps and rising choral pads, grumbling low ends and near-uptempo beats. The closer, “Ascension,” finds it way back toward a darker feel with a slow pace and big, bass drones. In the end, however, the sound takes a rising-sun turn and deposits the well-traveled listener in a safe place. Traveller is loaded with elements that will very familiar to tribal ambient fans, but still manages to avoid coming off as simply derivative. The track-to-track movement shows a lot of forethought and a distinct through-line. There’s a story at work here, and it will hold your attention. Through the contributions and talents of seven artists, Traveller becomes vibrant, diverse, and quite effective. It marks a very promising stepping-off point for Undara.